The second phase of the seven-phase Lok Sabha elections 2019 was held in 95 constituencies across 13 states and Union Territories (UTs) on Tuesday. As many as 1,644 candidates from across various parties and independent ones were in the fray for these 95 seats. The 2019 Lok Sabha polls began on April 11 with the first phase of voting across 91 seats dispersed across 20 states and Union Territories. The third phase of voting, to take place across 116 constituencies in 14 states and UTs, will be the biggest in terms of the number of seats where electors will exercise their right to franchise on a single day. The fourth phase will be on April 29 (71 seats in 8 states and UTs), the fifth on May 5 (50 seats in 7 states and UTs), the sixth on May 12 (59 seats in 7 states and UTs), and the final phase on May 19 (59 seats in 8 states and UTs). The results to for the 543 Lok Sabha constituencies across 36 states and UTs, as well as 413 Assembly constituencies — where state elections in Andhra Pradesh, Odisha, Arunachal Pradesh and Sikkim are taking place simultaneously with national elections 2019 — will be announced on May 23, 2019. In the second phase, of the 1,644 candidates in fray, the most (845) are in Tamil Nadu, which also has the highest number of seats going to polls (all 39 Lok Sabha seats in the states. The fewest candidates are in the three states and UTs with one seats each — 10 in Tripura, 11 in Manipur and 18 in Puducherry. In terms of average number of candidates contesting on a seat in a state, however, Odisha has the fewest at seven (a total of only 35 candidates for the five seats going to polls on April 18), while Tamil Nadu has the most at 21.7 (845 for 39 seats). The top three among individual constituencies with the most number of contestants are Tamil Nadu ones of Karur, Chennai South and Thoothukkudi — 42, 40 and 37, respectively. By comparison, individual seats with the fewest number of candidates are Autonomous District in Assam, Kandhamal in Odisha and Hassan in Karnataka, with five, five and six seats, respectively. 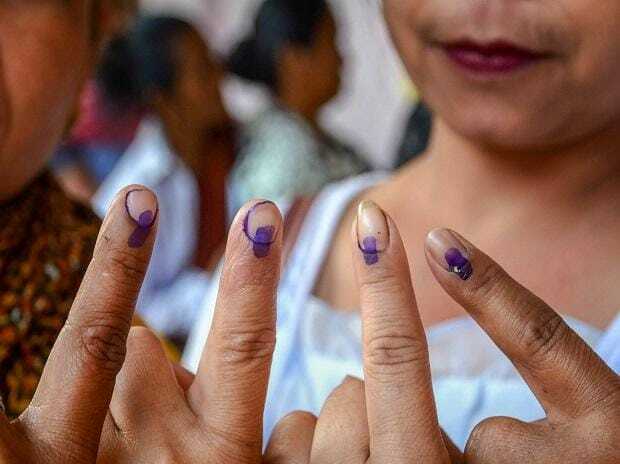 Assam: Five of the 14 Lok Sabha constituencies on Assam — Autonomous District, Nawgong, Mangaldoi, Silchar and Karimganj — will go to the polls on April 18. A total of 50 candidates will in the fray across these five seats. In the 2014 Lok Sabha elections, these five seats had a total of 57 candidates — 50 male and 7 female. These constituencies had a total of 3,929,510 electors — 2,000,733 of them male and 1,928,777 female. Manipur: The state of Manipur has 1 of its 2 Lok Sabha constituencies — Inner Manipur — voting in the second phase on April 18. This seat has a total of 11 candidates. In the 2014 Lok Sabha elections, this seat had a total of 8 candidates — 7 male and 1 female. This constituency had a total of 769060 electors — 424521 of them male and 344539 female. Tripura: The state of Tripura has 1 of its 2 Lok Sabha constituencies — Tripura East — voting in the second phase on April 18. This seat has a total of 10 candidates. In the 2014 Lok Sabha elections, this seat had a total of 12 candidates — 10 male and 2 female. This constituency had a total of 1067447 electors — 529027 of them male and 538420 female. Like Assam, Bihar also has five of its 40 Lok Sabha seats going to the polls in Phase 2. These are Bhagalpur, Katihar, Kishanganj, Purnia and Banka. These constituencies have a total of 68 candidates in the fray. In the 2014 Lok Sabha elections, these five seats had a total of 83 candidates — 78 male and 5 female. These constituencies had a total of 4,494,349 electors — 2,198,805 of them male and 2,295,544 female. The state has three of its 11 Lok Sabha constituencies — Kanker, Mahasamund and Rajnandgaon — voting in the second phase on April 18. These 3 seats have a total of 36 candidates. In the 2014 Lok Sabha elections, these seats had a total of 50 candidates — 45 male and 5 female. These constituencies had a total of 2617259 electors — 1376886 of them male and 1240373 female. Two of Jammu & Kashmir’s six Lok Sabha seats will see voting in Phase 2 on April 18. These are Srinagar and Udhampur. These two constituencies together have 24 candidates in the fray. In the 2014 Lok Sabha elections, these seats had a total of 27 candidates — 25 male and 2 female. These constituencies had a total of 2223931 electors — 1226641 of them male and 997290 female. Half of Karnataka’s 28 Lok Sabha seats will go to the polls in phase 2 on April 18. These 14 seats are Hassan, Chamarajanagar, Udupi Chikmagalur, Dakshina Kannada, Kolar, Bangalore Rural, Chikkballapur, Tumkur, Chitradurga, Bangalore Central, Mandya, Mysore, Bangalore South and Bangalore North. These 14 seats have a total of 241 candidates. In the 2014 Lok Sabha elections, these seats had a total of 233 candidates — 220 male and 13 female. These constituencies had a total of 26429948 electors — 13945598 of them male and 12484350 female. The state of Maharashtra has 10 of its 48 Lok Sabha constituencies — Latur, Akola, Buldhana, Solapur, Nanded, Osmanabad, Parbhani, Amravati, Hingoli, Beed — voting in the second phase on April 18. These 10 seats have a total of 179 candidates. In the 2014 Lok Sabha elections, these seats had a total of 206 candidates — 191 male and 15 female. These constituencies had a total of 10714625 electors — 5936021 of them male and 4778604 female. The state of Odisha has 5 of its 21 Lok Sabha constituencies — Kandhamal, Bargarh, Aska, Bolangir, Sundargarh voting in the second phase on April 18. These 5 seats have a total of 35 candidates. In the 2014 Lok Sabha elections, these seats had a total of 45 candidates — 40 male and 5 female. These constituencies had a total of 5934311 electors — 3105537 of them male and 2828774 female. The UT of Puducherry has its only Lok Sabha constituency voting in the second phase on April 18. This seat has a total of 18 candidates. In the 2014 Lok Sabha elections, this seats had a total of 30 candidates — 28 male and 2 female. These constituencies had a total of 1356036 electors — 756939 of them male and 599097 female. The state of Tamil Nadu has all 39 of its Lok Sabha constituencies — Nilgiris, Kancheepuram, Thanjavur, Tiruppur, Chidambaram, Viluppuram, Coimbatore, Pollachi, Arani, Dharmapuri, Kanniyakumari, Krishnagiri, Nagapattinam, Arakkonam, Perambalur, Sriperumbudur, Erode, Tiruvallur, Cuddalore, Dindigul, Salem, Chennai North, Ramanathapuram, Vellore, Kallakurichi, Tiruchirappalli, Tenkasi, Tiruvannamalai, Sivaganga, Tirunelveli, Madurai, Mayiladuthurai, Virudhunagar, Namakkal, Theni, Chennai Central, Thoothukkudi, Chennai South, Karur — voting in the second phase on April 18. These 39 seats have a total of 845 candidates. In the 2014 Lok Sabha elections, these seats had a total of 845 candidates — 792 male and 53 female. These constituencies had a total of 79411957 electors — 42328925 of them male and 37083032 female. The electorally most important state of Uttar Pradesh has 8 of its 80 Lok Sabha constituencies — Nagina, Hathras, Agra, Bulandshahr, Amroha, Mathura, Aligarh, Fatehpur Sikri — voting in the second phase on April 18. These 8 seats have a total of 85 candidates. In the 2014 Lok Sabha elections, these seats had a total of 125 candidates — 112 male and 13 female. These constituencies had a total of 8319160 electors — 4093209 of them male and 4225951 female. The state of West Bengal has 3 of its 42 Lok Sabha constituencies — Jalpaiguri, Raiganj, Darjeeling — voting in the second phase on April 18. These 3 seats have a total of 42 candidates. In the 2014 Lok Sabha elections, these seats had a total of 37 candidates — 35 male and 2 female. These constituencies had a total of 2857258 electors — 1609141 of them male and 1248117 female.